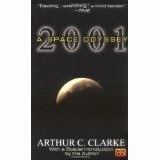 Sign up to read the book, 2001: A Space Odyssey written by Arthur C. Clarke, and then watch the movie on June 30th. Unlike most, this book and movie were developed concurrently and the movie was released before the book. With science fiction themes such as the perils of technology and nuclear war, evolution, space exploration, and artificial intelligence, it is the perfect movie to watch in June during our science-themed adult summer reading program. Please call 580-7290 or sign-up at the front desk to register.